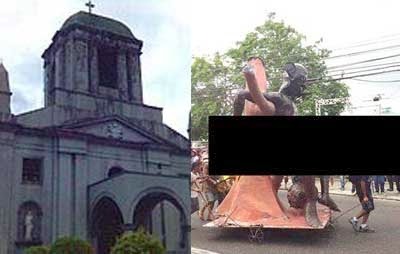 ALBAY—The Roman Catholic Church is asking for an explanation from Governor Joey Salceda regarding the controversial Tambaluslos effigy that was paraded here during the Daragang Magayon Festival. In an interview with Mark Kevin Arroco, Father Rex Arjona of the Diocese of Legazpi reminded Salceda of his promise last year that he would ensure that no scandalous effigies would be part of the said parade. It would be recalled that an effigy of the Tambaluslos was also present in last year’s Mythos Kan Albay activity. Arjona called the Tambaluslos effigy indecent. He further maintained that even if the effigy were not displayed at Penaranda Park, it was still paraded through the streets of Albay, where many people, including children, could see it. Meanwhile Board Member Ric Riva announced earlier that he also wants a legislative inquiry to be conducted by the Sangguniang Panlalawigan of Albay. Said inquiry will solicit an explanation from the organizers and the governor about the effigy.